Basil Myers died in Cape Town on 14 June 2008, succumbing to cardiac failure unresponsive to all that modern medicine and technology could offer. 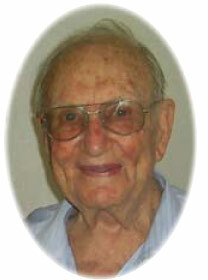 Up-to-date technology was in sharp contrast to Basil's old-style family practice he pursued in Cape Town for over 60 years. Nevertheless, as an individual of exceptional enterprise, and possessing uniquely diverse skills and talents, he rose to the challenge of modern technology. Only months before his death he acquired a computer, and trained himself to become sufficiently literate to communicate with family members and friends with enthusiasm and great personal satisfaction. Basil Walter Myers was born in Paarl on 26 September 1914, one of a family of two sisters and four brothers, the latter four ultimately qualifying as doctors and practising as GPs in various parts of the country. Our mutual uncle, the late Frankie Forman, served in no small measure as an inspirational role model for the direction we all pursued. Basil's consulting rooms were initially located in an old Victorian building at the top of Long Street, Cape Town, the upper floor being occupied by as yet an unknown and struggling artist who would in the course of time emerge as a much sought-after South African artist - Gregoire Boonzaaier! From his premises opposite the Long Street Baths, Basil pursued his general practice from one end of the Peninsula to the other. The practice developed rapidly, and even in his latter few years, his devoted patients would consult him at his home in Kloof Nek Road. Apart from his general practice, Basil was a 'generalist' in more senses than one. As a student and in his earlier years as a doctor he serviced his own motor vehicles, assembled complex electrical equipment, became an expert photographer, and took great joy in his photographic dark room. He also developed skills in carpentry, fretwork and wood-turning, the crafted objects he created being generously distributed among family members and friends. In his married years he became proficient in all culinary arts, baking breads and cakes, producing various jams, preserves and pickles, and in his back-yard lovingly nurturing his vast array of orchids - and he excelled at each of these activities. Basil was a devoted and beloved family man and was always there for his daughter Sybil, son David, and their families of seven grandchildren and four great-grandchildren. With equal devotion he cared for his ailing wife, Sadie, year in and year out, until she died in May 2006. Basil Myers was, as his son David and grandson Anthony lovingly expressed to a packed memorial service gathering, 'an amazing man'.